I had the pleasure of meeting one of these cuties in person. A lady was carrying her small puppy that she had just bought into the post office...needless to say, there were a group of admirers around her and her puppy, including me. 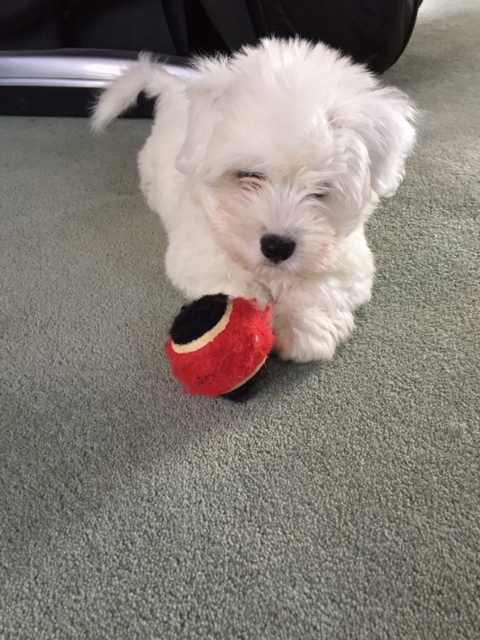 The Coton De Tulear was known for centuries in Tulear, in southern Madagascar. It was brought to the United States in 1971. They are delightful small dogs, similar to the Maltese. Dogs are 12 1/2 inches high and weigh under 9 pounds. The most outstanding characteristic of this breed is the coat. It is composed, as the name suggests, of long, heavy, cottonlike hair. It is white with slightly yellowish markings on the ears. Awwwwww! He's so CUTE! What's his name? Starlight is such a nice name and he's so cute! When I was training my pups, I always took weeks off from work to do it, but now I'm retired so it's better. I get up really early in the morning to walk them in the back yard on the leash to train them to go outside. Worked very well, they usually have to do something the minute they wake. In the house I used newspapers in small area of the kitchen and used a baby gate to keep the pup there until he was trained fully, my dogs were always reliable in the house, never soiled after the initial training period. He is a real cutie! I'm a big believer in crate training. Done right its fast and the dog is reliable. I have my shepherds trained in as little as three weeks.